Slowly but surely the curtain is falling on the Wanni theatre of battle. The Army has confined the guerrillas to a mere 19 square kilometres, including the civilian safety zone, near the coast of the Mullaitivu district. Whilst a nation readies for the National New Year, the coming days will see heavier battles before the Liberation Tigers of Tamil Eelam (LTTE), lose one of their proudly touted claims. For more than two and half decades the guerrillas had boasted of dominating one thirds of the country's land mass and the coastline from Wilpattu in the north-west to the north, and down the east to near Yala in the south-east. This claim held despite losing ground on and off for more than quarter of a century. But President Mahinda Rajapaksa's relentless military campaign, casting aside domestic and local pressure, is to give him one major dividend. When the guerrillas lose their remaining terrain, minuscule compared to areas they dominated, Rajapaksa can boast, as he seems to be doing, quite justifiably that he has accomplished what his predecessors failed - deny to guerrillas even a toehold of terrain. However, as military leaders have taken pains to point out, the guerrilla threats will not only remain but manifest themselves in newer forms. But that is another issue - and it may be a tinge unfair for Rajapaksa to take all the glory when his predecessors did, in their own way, try to contain and defeat the Tigers during their time. In the light of the new developments, there appears to be a rapid transformation both in the battle zones and outside it. At least two aspects are significant. 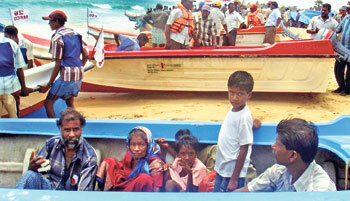 One is an exodus of middle and even senior level LTTE cadres from Mullaitivu area by boat to southern India. Repeatedly, the Sri Lanka Navy has denied reports that such activity was going on because of the security cordon they had been placed in the high seas. Yet, reports from Chennai this week tell a different story. One instance was when a group of civilians, some of them injured in the recent fighting between the Army and the guerrillas, had not only arrived on the Tamil Nadu coast but successfully gained access to a refugee camp there. Fear of being found out in the State of Tamil Nadu, reports say, had prompted guerrillas to move to the adjoining State of Kerala. This week Indian Police commandos locked down a stretch of the coast and launched a house-to-house search for guerrilla suspects. Kerala's Police Chief Jacob Punnoose told reporters in Thiruvananthapuram that the search in the village of Thykkal, near the coastal city of Kochi, followed reports that Sri Lankan guerrillas were infiltrating. "The area is thickly populated. We are not allowing any person or vehicle from the village to move out," Punnoose was quoted as saying. However, so far, he said, the Police have not found any trace of fishing boats that have landed or persons who had infiltrated. Yet, security authorities in Colombo have received independent reports that some guerrillas had reached hideouts in Kerala. These reports have naturally turned the spotlight on LTTE leader, Velupillai Prabhakaran and his son, Charles Anthony. Whilst Prabhakaran is known to be still in the shrinking battle zone, as reported first in The Sunday Times Political Commentary of last week, son Anthony sustained minor injuries due to Army artillery fire. Anthony is known to have at one time left Sri Lanka for a European destination with a message from his father, but later returned to join him. However, either for reasons of secrecy or otherwise, the LTTE's European lobbies who are in the know of developments in Sri Lanka, have denied his travel. He is now reported to be actively helping guerrilla cadres and taking part in military activity. Causing some concern for the security establishment in this backdrop are reported new shipments of military hardware reaching the guerrillas. As reported last week, the guerrillas used Surface-to-Air Missiles in a bid to bring down two helicopters ferrying injured soldiers from the battle zone. It has become known that these were fresh acquisitions. Heightening these concerns was the outcome of a raid in Vavuniya. Among other items, it led to the discovery of a stock of brand new grenades, again suspected to be from recent shipments. A report that Norway's International Development Minister Erik Solheim had made a 30 minute satellite telephone call to LTTE political wing chief B. Nadesan. "Our political head categorically told Mr. Solheim that a serious responsibility rests on the International Community to put an immediate stop to the attacks on the Tamil civilians," Tamilnet quoted LTTE's S. Puleedevan as saying. The report added: LTTE's Political Head reiterated the Tiger position on immediate ceasefire and resumption of negotiations to achieve a lasting solution to the conflict. The topmost priority now is an immediate ceasefire to put a stop to the massacre being carried out by the Sri Lankan forces, Nadesan has told Solheim." It is questionable, to say the least, when Nadesan calls upon the international community to "put a stop to the attacks on Tamil civilians." The reality, acknowledged by the international community including the United Nations is the fact that the LTTE is preventing the civilians from leaving the area. The reason is no secret. If it does, the Army could easily single out the guerrillas and the military campaign would be over sooner than later. It is therefore very clear, and Nadesan admits that, when he says "the topmost priority now is an immediate ceasefire…." Kumaran Pathmanathan (KP) who now styles himself as S.Pathmanathan, told Tamilnet: "The LTTE's insistence of a ceasefire is purely from a humanitarian perspective, to give relief and respite for the people caught in the conflict. It is a myth that the LTTE had built up its military capacity during the ceasefire. Looking at it carefully it will become evident that the Sri Lankan government was the one that militarily strengthened itself during the six-year ceasefire between 2002 and 2008 and not the LTTE." The remarks came during a Q & A posted on the website. Pathmanathan adds: "If you observe the history of the conflict, the LTTE was strong during periods of conflict. The battles for Mullaitivu, Killinochchi, Elephant Pass and the Sri Lankan Operation Jayasikuru were all fought and reversed when the Sri Lankan Government had an upper hand. "It is wrong to assume that the LTTE is in a weakened position. LTTE is a versatile and resilient movement. Control of territory has constantly changed hands during the past thirty years of war. Several examples of reversals have been witnessed in the past. To believe that the LTTE is a spent force is not correct." Pathmanathan, now dubbed as head of LTTE's 'international relations' is no ordinary man. He is one of those most wanted in the world. The Interpol has issued a red notice on him. The LTTE has been able to sustain a military campaign all these years only because Pathmanathan was able to procure its military requirements. And now, it is the same Pathmanathan who is claiming that the LTTE is asking for a ceasefire from a "humanitarian perspective to give relief to the people caught in the conflict." The question is whether such relief would not come to the people if the civilians were let off - as simple as that. But, if that happens there would clearly be no relief to the LTTE. It is in this backdrop that the Government expressed its strong displeasure to Norway's Ambassador Tore Hatrem. He had paved the way for a telephone conversation between Pathmanathan and Sir John Holmes, the United Nations Under Secretary General for Humanitarian Affairs. It was on the subject of civilian evacuation. However, the Government's position was that Pathamanthan was an internationally sought fugitive who was evading the law, and that the least Norway could have done was to have had the courtesy of informing the Sri Lankan Government of the move arguing that it was being done for the benefit of the civilians. Hatrem is also reported to have earlier had a meeting with Pathmanathan in an Asian capital, and Norway is under heavy suspicion in the corridors of power in Colombo for instigating Mexico and Costa Rica in particular to move the United Nations Security Council to hold a 'discussion' on the Sri Lankan situation. The Government's position on the contacting of Pathmanathan had been explained to Oslo's Ambassador after he was summoned to the Foreign Ministry. But there is another version to this story. The Norwegian ambassador Hatrem, had in fact, briefed top government leaders before he met Pathmanathan -- a meeting that led to the LTTE’s international relations chief’s meeting with John Holmes. As for the LTTE, it was another opportunity to market its newly-appointed International Relations chief to the international community. When the meeting eventually took place, the Norwegian envoy in conveying the strong views of the international players involved in conflict resolution moves in Sri Lanka, said that the LTTE had lost whatever little sympathy it had in the West, by continuing to hold civilians hostage and the only way out was for the LTTE to surrender and go for talks with the government. He had suggested that the All-Party Representative Committee (APRC) recommendations could be expanded at the talks and a solution could be worked out. Diplomatic sources say that Pathmanathan failed to impress upon the Norwegian the LTTE’s position or present a valid argument as to why the LTTE was still a force to reckon with and why the blame should be placed on the Sri Lankan government for the plight of the civilians. The meeting ended inconclusively. The protests that followed the meeting helped the Norwegians to drop Pathmanathan and get Solheim to speak to Nadesan and convey the same message which the international players wanted carried to the LTTE. It now appears that Pathmanathan may not have briefed his masters on the points conveyed by Hatrem. As these diplomatic moves continued, the government also seemed to have played its usual double game. It has become the practice of this government to seemingly give a nod to a move by one country or another and then to get the Foreign Office to protest after giving it negative publicity in the 'friendly' media. This happened when Britain wanted to appoint Des Brown as special envoy. As evident in the statement British Foreign Secretary David Miliband made to House of Commons on Thursday, Britain still insists that it spoke to President Rajapaksa before it announced the appointment of a special envoy. Later, Hatrem, Government sources said, met with President Rajapaksa to explain the reasons for his conduct. Norway, which still remains the peace facilitator, had intervened on behalf of the civilians trapped in the battle zone and have been trying to persuade the LTTE to allow them to leave. However, the guerrillas had remained adamant that there should be a ceasefire. Another reason, according to Colombo-based diplomats, is a move by the Donor Co-chairs to form a US-backed 'coalition humanitarian task force' to evacuate the civilians. This was exclusively reported in The Sunday Times. The task of obtaining LTTE's concurrence had been placed in the hands of Norway, a member of the Co-chairs. "The matter has now been resolved after Hatrem met President Rajapaksa," the sources said. With the impending re-capture of the remaining 19 square kilometres of terrain, the Government's attention has already turned to 'post war' development. In this regard, the Government, cash-strapped as it already is, is pinning its hope on a massive US$ 1.9 billion loan from the International Monetary Fund (IMF) on the footing that the money is partly for re-construction of the war-ravaged North and East. The IMF delegation which concluded talks with the Government this week has left leaving behind questions on whether the loan would materialize. Economists believe the IMF will not take into consideration political issues but base its assessment on other criteria, mainly economic and good governance factors. Sri Lanka, they say, has not committed any sovereign default barring one exception - the oil hedging issue involving the Ceylon Petroleum Corporation. However, one important fact emerged during the IMF team's talks in Colombo. Among those the delegation met with was the United National Party (UNP) and Opposition leader Ranil Wickremesinghe. The Sunday Times learnt that delegation members made clear that the loans would be subject to conditions the IMF would lay down. This contradicted claims by Government leaders and Central Bank officials that the Government will not agree to any conditions in obtaining the IMF loan. Minister Sarath Amunugama went on record saying that the IMF of today is different to the IMF of yesteryear, a financial institution that had been discredited by third world countries because of its insensitivity and inflexibility to the realities of such countries. One such condition the IMF may impose, it is learnt, is a realistic exchange rate. Already this week, the rupee equivalent of a dollar dropped to over Rs. 116. The looming economic war might be an even more daunting task for Rajapaksa to handle compared to the battle with the LTTE. This week he kept the spirits of the Armed Forces high by saying that "no power on earth" can ask him to stop the war against the LTTE. Western powers were still going at him asking him for a ceasefire, a 'humanitarian pause', and what not to stop the assault on the LTTE almost as if they did not wish to see the LTTE totally vanquished. UN Secretary General Ban-ki Moon issued a statement asking the LTTE to allow the civilians to escape the firing. He might be the first person surprised to know that the LTTE will listen to him. David Miliband, the British Foreign Secretary, made a statement on Thursday in the House of Commons saying that "the over-riding need is for an immediate end to the tragic humanitarian crisis". Miliband seems to have got it wrong. The over-riding need is for an immediate end to this separatist insurgency that has ravaged Sri Lanka for the past 25 years and more. Probably exasperated by these calls from overseas on the plight of the civilians trapped in the fighting, the Sri Lanka Government also issued a statement yesterday joining the chorus expressing its own concerns. For Rajapaksa, a new war is however opening - the economic war - while, hopefully, an old one gets extinguished. We gamble with our lives, while you hold the line!